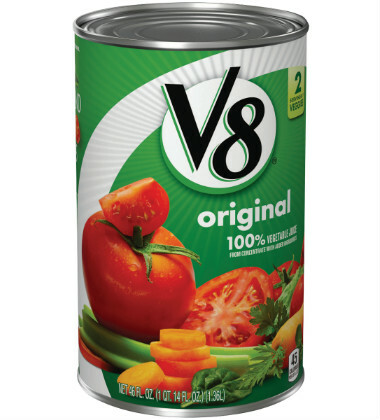 Flavor up plain couscous with V8® 100% Vegetable Juice. Combined with garlic, mushrooms, zucchini and red bell pepper, this perfect side dish compliments any menu. garlic, peeled, minced	 3 tbsp. mushrooms, sliced	 2 lb. 3 qt. zucchini, grated	 2 lb. 1 qt. dried thyme, leaves, crushed	 2 tsp. 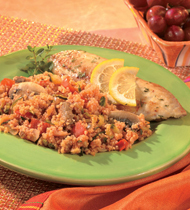 couscous	 20 oz. 1 1/2 qt. 1. Heat oil in stockpot. Add garlic and cook until lightly browned. 2. Add onion, mushrooms, zucchini, red pepper, thyme and black pepper. Cook and stir for 5 minutes or until vegetables are tender-crisp. 3. Add vegetable juice. Heat to a boil. Remove from heat and stir in couscous. Cover and let stand for 5 minutes or until liquid is absorbed. Fluff before serving.CCP: Heat until internal temperature is 165°F. or higher for 15 seconds. CCP: Hold at 140°F. or higher. Portion mixture using 8 oz. ladle (1 cup). mushrooms	 2 lb. 3 qt. zucchini	 2 lb. 1 qt.